To say that today, January 28th, is a significant day would be a vast understatement. Today marks one year since doctors found the blob in my dad’s head and one year since my dad and I wrote our first blog post titled “Tumor Humor”. Today marks one month since December 28th, 2013, the day of my dad’s “graduation” (if you will). And today has aptly been declared “Loren Nancarrow Day” in San Diego. The 1 is a doer, a powerful force that produces results and does not allow anything or anyone to limit its’ potential. The 1 is always in the forefront: a spearpoint directing and leading others. The shape of the number 1, just like the shape of all other symbols, reflects its meaning; it walks upright with pride and purpose. Strong, determined, unwavering and with specific goals in mind, the 1 can turn dreams and ideas into reality. The 1 grows, transforms and improves in perpetuity, precisely the way Mother Nature does. After all, nature’s primal force and most basic building block is the number 1. Nature knows no mercy and its’ cruelty can be heartbreaking. However, it knows balance and gives life indiscriminately and without judgment. It is, if you haven’t guessed, the most masculine of all numbers. There is a certain quality, a sense of honor and responsibility that demands our respect, and it has a sense of justice that cannot be denied. 1. My strength will come from humor—not worry. 2. I find wonder in sunrises and sunsets, the relationship between a bee and a flower makes my eyes wide. 3. The workings of this world mystify me daily. 4. I’m not giving up and never will. 5. There is no time to dwell on the negative. 6. [Brain cancer]…is not something I asked for but I accept it and I see it as my latest journey. My senses are sharper, my appreciation is deeper and each experience holds more wonder. 7. I just want to offer a few words of encouragement: If you ever find yourself suddenly faced with this seemingly torturous medical sentence—don’t sweat it. You can do this! 8. Get out there and speak truth to power. Our words and pictures are still the most powerful tool we have to make a difference. 9. I don’t know how this chapter of my life will end. I’m hopeful and I’m treating it much as I’ve treated other challenges in my life—with hard work where it’s needed and plenty of jokes where they’re not. 10. While I hate cancer, I’m so happy that it has given me a chance to learn from its’ survivors. 11. Turns out I liked being informed of my statistical odds. I appreciate the sense of urgency it provides. It reminds me that there’s a lot of life left to live. 13. The moment I’m living in now is what I’ve got. 14. I want keep this good feeling going. 15. I’m obsessed with having a good time. 16. Peace and compost, San Diego. 17. I’ve got man stuff to do—rattlesnakes to wrangle, fires to build and facial hair to grow. 18. No panicking allowed, these are the easy times. 20. If you’ve got cancer: DON’T FREAKING GIVE UP. 21. I’ve been so impressed by all of the survivors I’ve met in recent months. Thank you for teaching me how to be strong. 22. There’s something I’ve been feeling lately — it’s a feeling of inclusion, of belonging to a group of badass people fighting for their lives…I’m inspired by my teammates. I’m inspired their energy, their drive and their reluctance to give up. 23. I’m wishing strength for you in your own personal battles with illness and all of life’s other lemons. 24. As I transform from this world, I hope to be thrilled by what I experience next. 25. Now I’ve come to the next road in my journey, where I’m learning acceptance, and to be at peace with the understanding that my time is extremely limited. 26. Happiness lies in discovering your passions and exploring them fiercely…Wherever they are, whatever they may be, seek out your passions and cultivate them. 27. The most important lesson I’ve learned throughout all of this, is that it is far better to do good for others, than to do good for oneself. 28. I believe that life is energy and energy can neither be created nor destroyed, it can only change forms. And whatever form I take on next, I just hope my connection to those I love will remain. Well Dad, I feel a connection to you whenever I look at the ocean or see a bird in flight. I feel a connection when I drive your car, when I take Django for a walk and when I wear your t-shirts to bed at night. I feel you in the kitchen, at our Starbucks down the street and every time I hear your favorite songs on the radio. And I certainly feel connected to you today. HAPPY LOREN NANCARROW DAY, SAN DIEGO. I have been thinking about your dad. I met him in person at a Fallbrook Youth Baseball game. He tossed a ball to my little guy (who will be 25 in Jan 2018) and spoke with me and my husband. What a great guy and I will never forget him. Jan. 28th is when my oldest son was born (1986), such a special day! I have been reading the blog and find it comforting. My husband found out before Thanksgiving that he has cancer in his right lung, pancreas, and liver. He has a biopsy Dec. 5th and from there all the appointments. I am so very blessed to believe in a compassionate and loving God and all of HIS promises. Our parents blessed us, through faith, that we would come to believe in an Almighty Savior! We have brought our children up in the same manner. You have touched our lives through this blog! Thank you for the lovely note. I am so sorry to hear about your husband and we will all keep him in our prayers. That’s so thoughtful and kind. Thank you. Loren you are always missed but we get to see you through your beautiful children. Your dad has been an inspiration to so many of us who love nature and all the beauty it bestows upon us if we just take the time to slow down and look. Every time I turn my composter down here in Baja I think of Loren. We all have a story of life and death, just some of us have even more to give towards the end. What an example of love, strength and wisdom, beyond what most of us have witnessed. His attitude on living while dying is inspiring. I wanted to share a poem I wrote when my family lost a bright light also. I hope it brings you comfort. The wind is blowing now, your soul is now set free. I can feel you when it whispers, I feel you in the trees. The sky is now exploding, with colors heaven sent. I can feel you in the sunset, I feel your souls intent. Intent to give us peace and comfort from our pain. The clouds are opening up, I feel you in the rain. The waves are crashing in and out, their force is undenied. I can feel you in that rhythm, I feel your soul inside. Inside my heart I feel you, I know I’m not alone. This harmony that you’ve given me, I know that you are home. I feel you in their brightness, I feel you soaring high. I feel you whisper in my dreams, like a soft and gentle breeze. And though I will be missing you, you’ve put my mind at ease. 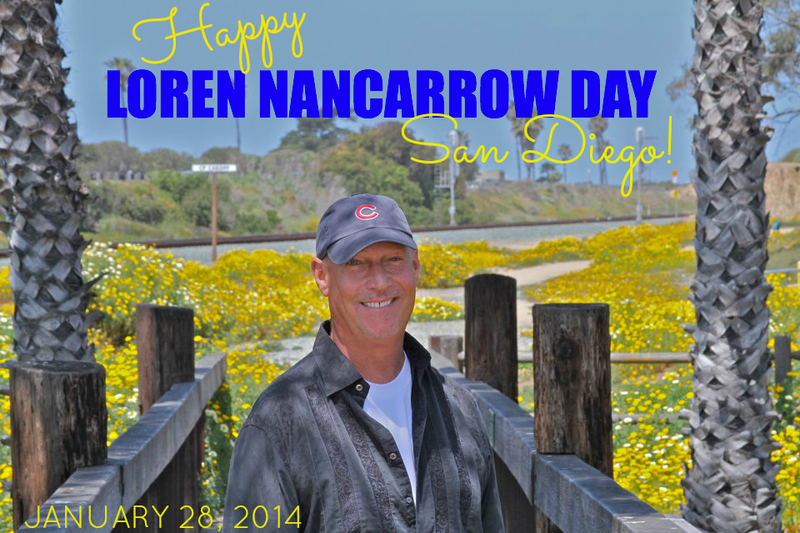 I truly appreciate your article, dear Hannah, on this Jan. 28th of 2015, “Loren Nancarrow Day in San Diego!” Your brilliant, humorous, insightful, handsome RIP Dad, could use just a few words containing such brilliance and inspiration to one and all. I’m so very pleased to have become friendly with Loren and am sending you, beautiful Susie, handsome Graham & adorable Britta my love, hugs & prayers in support!! tears in my eyes, because your Dad was so touching and you, at the end, Hannah– You have a lifetime of stored-up memories, to keep you company and remember your Dad with. He lives with you still. I’m sorry, you can’t touch him right now. But there will come a time……. In between now and then, just keep doing what you’re doing. From my view, you’re doing just fine, kiddo! Hi Hannah: we have never met but like many others I am a big fan of your father. My wife and I met your parents at our home in Rancho Santa Fe in 2002 for a benefit for the Rancho coastal Humane Society. They treated us like people they had known for many many years as he did many other people and this is what made your folks so special. I think your blog is very emotional and I thank you for sharing it with us. Is inspiring me as I fight my battle with ALS. I look at the three books your father autograph for us and I smile. Best wishes Hannah. Don Daniels. The best of the best. Your Dad looked and foresaw much like years back my dearest friend did. His last blog added the missing chapters to Stephen Hawkings attempts to explain the universe. Transcending has been proven and reproven through my career and life experience. Draw strength and peace in this as you clearly are experiencing it too. Your Dad did his best to light the way and leave you all the peace and comfort in the knowing. thank you for continuing to share thoughts of love, and encouragement,. your family is such an inspiration to anyone going thru diversity. my niece is battling ovarian cancer and she is an inspiration to us all too. we can only know what they share as to how they handle the situation they are enduring. thank you for all the positive energy even in loss, it is felt. thank you! I hope to be as strong, inspiring, blessed and gracious as your father, your family and your words when my time comes…I want to be remembered for my enthusiasm, my silly sense of humor and the profound love I freely shared. It is inevitable we miss those we lose…whatever the circumstance…it is a gift to love the ones we make memories with…here’s to each person that makes an indelible impression in our lives, upon our hearts and remains in the most precious manner…in our laughter, tears, sweet, touching, inspiring memory. Hannah, I had the great privilege to meet and do work for your father. He hired my company to build corral fence at your home. For the two weeks we were at the house he and I interacted in daily conversation. I felt connected…wishing to be half the person he was. At the end of the job he was curious why I hadn’t asked him for any down payment up front for the work we had done. I told him that I work on a handshake. He smiled (that famous smile) and said, “Hmmm, old school…I like that”. Again I felt the connection. That was just how he made you feel. He was, is and always will be an amazing and inspirational person in my life. I feel fortunate to have met your Dad and will remember him forever. Wow! Powerful stuff. What a gift you have to see the beauty in the loss. Hannah, That was beautiful! Hugs to you and the family! You and your Dad always had/have amazing words to live by! With just reading these little notes from your father I feel inspired. I show photos and speak to new and young drivers on the safety and reckless dangers of driving due to the loss of my daughter. I’m inspired to put all that I have into speaking everywhere and anywhere to get the message out. I was saddened not only by our loss of Loren, but also with our loss of connection with you Hannah. Reading your posts not only kept us in touch with your Dad, but taught us how to live in that world. I think of him often, when looking at my garden, guilt at sick plants, yes, Loren, I’ll work on that, but the beauty of flowers and nature as well. Thanks for getting back to us. You’ve been missed. Peace to your whole family. I’m glad there is an official day to remember your father in his home town. I hope we all continue to follow his lead and take delight in the beauty of our blue planet and each other. Although there are down sides to our life on earth, there is beauty anywhere we look for it. Hannah, Years ago when I lived in “Americas Finest City”, your Dad always stood out as part of its greatness. Little did he know where his life would take him as is true with all of us, yet for whatever reason, he paid attention. Heartbreak can cripple, yet its the inspiration and strength that one gains and shares that becomes the true gift. Life isn’t about what we have, but about what we give and learn to believe through the journey.Millions leave this life every day and we don’t even know their names, yet your Father’s message through the final days of his life are so very important. They’re important, not because of his true charm on a bluff over looking the Pacific, but because he came full circle in his appreciation for life, his family and the people who knew him, even from a distance. His presence has only begun and what he left us is a reason to be better. Some will pay attention and……. some won’t, but for the ones he inspired, we need to make “small differences” everyday. I know your pain, yet its the inspiration that takes us from here…….. that will move us all to greater moments in this life. My dad was imperfect and he’s now been gone for 10 years. Yet, I always feel as if he’s there with me. Bet you have the same exact feeling. Thank you for continuing to write your blog, although it must be difficult for you. Your family is such an inspiration; I was sad to think that you may no longer write. Because your dad and your family’s journey through his illness touched so many people, I am glad a day was declared in his honor. HAPPY LOREN NANCARROW DAY! Today I went for a long walk. It was a delightful, sparkling day and on my walk I saw some truly amazing things. When I got home I felt tired and refreshed, as odd as that sounds. I sat down to check my mail and found out it is Loren Nancarrow Day. Having read your blog, and in honor of Loren, I pledge to go for a long walk EVERY January 28 from now on and think of my splendid, glorious, curious, interesting life. Thank you for the nudge. Also, I was kind of wishing I was born on the 28th, too and it came as a kind of shock to realize I was born on the 30th. So, that translates to the number 3. I know enough about numerology to know what that means on the Tree of Life, and I was suddenly very pleased with me. I’m a 3. I’m a lucky dog! Of course I have known that for a long, long time, but I had forgotten about it, so thanks, again, for the memory nudge. I am smiling as I write this. This is so insightful and heartfelt. Your bravery and sharing and insight are so vividly written. Hannah. I love reading about your dad. I love reading about your feelings, and his feeling for life. It will forever be with me. I keep wondering how your mother is doing. What a beautiful and sensitively written post….thank you for sharing your thoughts and your feelings with us. Your father will live on forever in the hearts and minds of all who knew and loved him. A very special man with a very special family. Loren’s wisdom often guided my planting, gardening, weather insights… Today his wisdom brightened my spirit. Thanks Hannah. I admired Loren on the tv for many years. Peace to you and your family. Thank you for sharing. I miss you and your dad’s blogs. I hope you are all doing well. Hugs. Thank you for sharing these beautiful thoughts and encouraging others. You and your family are blessed with many things, among them – strength and peace. I’m sure you’re dad is applauding in Heaven. Beautifully written, as always!!! I must say, I was born on the 28th (November). Thank you for continuing to share. As usual it was straight from the hip. Wishing you light, peace and God’s continued blessings to you and The Nancarrow family. A friend in La Mesa :). Happy Loren Nancarrow day!